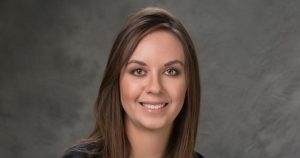 Emily Kokes has been promoted to the newly created position of Data Reporting Analyst for Premier Farm Credit. Emily’s knowledge, skills and talent make her the perfect candidate for this position, and we look forward to much continued success for her in this new role. She has previously been working as a Capital Markets Analyst in our Administrative office in Sterling. In her new role, Emily will be responsible for reporting, stress testing, SOX testing, Young, Beginning and Small borrowing programs, and much more. The role was created in part to deal with growing regulatory and reporting challenges, as well as to better align and define job responsibilities as we transition management roles in the coming months. She will continue to work out of the Administrative office. Emily is a graduate of Colorado State University, where she earned a Bachelor of Science in Agricultural Business with a minor in Business Administration. She came to Premier Farm Credit with work experience that included being a Loan Officer, Loan Clerk Assistant and bank Customer Service Representative. She and her husband Levi are raising their son on the family farm near Crook. Premier Farm Credit is a part of the Farm Credit System, which was established in 1916 to provide a stable and consistent source of financing for America’s farmers and ranchers. The Farm Credit System is still fulfilling that mission today- and tomorrow – and can be found supporting rural communities and agriculture across the country with reliable and consistent credit and related services. Premier Farm Credit has offices in Sterling, Yuma, Fort Morgan and Holyoke.